Post punk band from Sheffield, originally a twosome consisting of Adi Newton and Steven 'Judd' Turner. 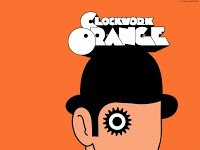 From a blog post from a Slavic fan it could be gathered that Clock Dva simply means 'two o'clock' (dva is Russian for two), but there is a more obvious counterpart, and that is that the band name is a reference to the book A Clockwork Orange by Anthony Burgess (later so successfully filmed by Stanley Kubrick). The teens in Burgess' book speak the so called Nadsat language, mixing English slang with Russian: friends are called droogs, girls are devotchkas and intellectuals are sofisto's. Clock Dva can for this reason also be interpreted as 'Clockwork Orange version 2'.